Hello - Welcome to our Sale! Cash or Checks only. Please bring your own help to load heavier items. We do not announce prices before the sale. No pre-sales. The photos and descriptions are a partial list of items included in the sale. 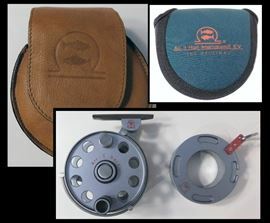 Ari' T Hart Fishing Reel and Tippet Spool. Ari' T Hart is a Dutch Artist born in 1936. One of his reels was on exhibit at the Museum of Modern Art in 1990. 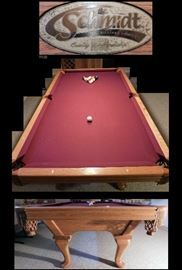 Schmidt slate top Pool table with Queen Anne legs. 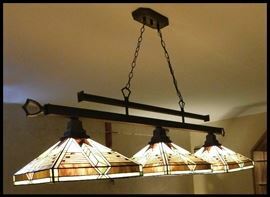 Tiffany style pool table light fixture. 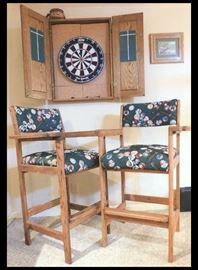 Pool Balls designed upholstered high chairs and dart board. 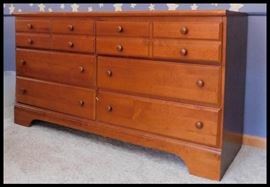 Six drawer dresser 54w x 18d x 30h. 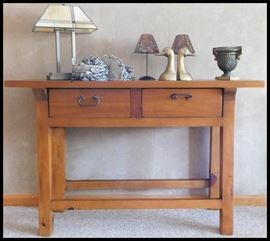 The perfect size table Attic Heirlooms 52w x 18d x 30h. 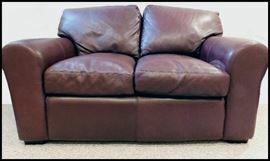 Leather upholstered twin sized hide-a-bed. Perfect for a child or smaller adult. Like new. 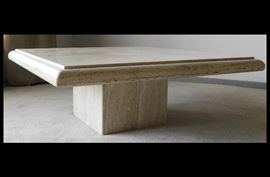 Large Classic Solid Marble Coffee Table. Bring extra folks with you for a loading party when you win this. 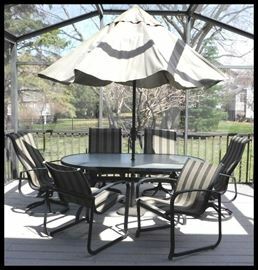 42" X 42" X 16" H.
It's time for Family and Friends on the Deck with these patio table, six chairs and umbrella ! Quality made. We also have a new set of sling seats for these. 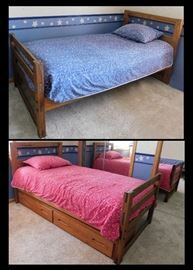 Wooden Bunkbeds. You can see these in Star Room upstairs at the sale. Create your own romantic cocktail time with this 30 inch round wood and iron high table and chairs In the background is one of two Ski Prints. Amish crafted cedar chest 42 w x 19 d x 21 h.
Dresser is 55w x 18d x 31h and the mirror is 29w x 43h. Gorgeous wooden lighted hutch (buffet) with glass shelving and mirrors. Two pieces 19" X 67" X 86" tall. Two Danish Modern side tables. Armoire 37 w x 77 h.
Chifferobe 42w x 22d x 59h. Danish modern table with six chairs. Oval mirror with grape leaves. Purchased at Antique Restorations. 24" x 40". Country Style painted bench with charming fishing village design plus copper pot, Tiffany style floor lamp and chest. Pole lamp, vintage chair and sample of colored glass. Side table 28 w x 21 d x 20 h and bedside lamp. Dressing Screen stretches out to approximately 54 inches. It is 70 inches tall. Lightweight and easy to move. Now you can dance while doing your paper work It's ADJUSTIBLE ! We call this the Princess Di Hat. It has the houndstooth design that we all love. Sonni by Lancaster - 100% Wool. The Bad Dog has houndstooth, too. Two items: a Cast Bronze Asian Figurine of Bodhisattva plus a decorative metal floral panel in the background. Notice the lotus blossoms at the base, too. Porcelain Child Figurine with a soccer ball created by NAO by Lladro called "Wanna Play?" Six New Replacements for the patio chairs made by Tropitone, known for their quality products. 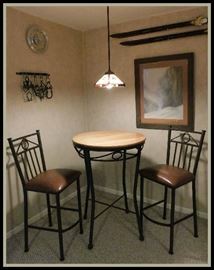 Dining Room Table with Four Chairs quality made by American Drew in North Carolina. Some of the books. Includes more than 50 Fishing Books plus everything from Tolstoy to Stockett to Cooking to Politics. Wire Art Shabby Chic Shelving. Designed to be almost whimsical. Whimsical Handcrafted Sculptures with Golf and Fishing Theme created by Paul's Father. Paul's dad is a remarkable wood carver and artist. These are some of the best chip carved pieces we have seen. Sampling of framed black and white photographs. Various subjects including boats. Hall Table with Mirror and Lamp. Plus sample of the collection of Fishing Artwork. Pictured is a winning Trout Stamp print signed by James R Fliger. Limited edition print by B. M. Jackson. I think I would rethink using my middle initial. Large Framed Print by Lynn Hays (Born 1950 in Wyoming). Signed lithograph 35 inches by 38 inches. Framed Coffman Huss 22 and half by 26 inches Limited Edition Signed Print - eight out of five hundred. A remarkable depiction of the historic Chicago Water Tower. Tall Twelve Inch Murano Glass Clown Playing an Accordion. Handblown in Italy. Raku pot with brilliant copper glazes. Approximately twelve inches tall. It is much more vivid and shiny than the photo shows. Glassware - some crystal, dining items, collectibles and a finely handcrafted Myrtle Burl Box. 1978 Vintage Master Sexton manufactured by Davis Instrument Incorporation. Who needs GPS ? Navigate by the stars ! A. K. Best Fly Tying Vise. One of the finest in the world. Four Fishing Reels by Baitcasting and Pflueger. New and still in the box. Many, many Lures and necessities including PK Lures, Black Rock Tackle, Brookside Flies, Swimbaits, Flutter Fish, Beadtail, Jigs and more. Fishing Reels. Pictured here are the Shimano ML20, Emerald 850 and the Shimono Corsair.